(November) Went into a second printing of Scoria Roads with additions, revisions, and an update of the oil industry in western ND. This Second Edition, published in 2017, is available NOW!!! In Sept. 2016, Norma received the Heritage Education Commission Annual Beverly Paulson Family History Award in the Memoirs Category for her book Scoria Roads! “Scoria Roads” is now available on loan on CD at the North Dakota State Library for the visually impaired, physically impaired, reading impaired, and those recovering from surgery. To get a copy, email: tbooks@nd.gov. For those out-of-state, ask for directions on this email on how to receive it. Here is a dynamic memoir set mostly in the barren prairie of western North Dakota where hardship and heartbreak are mirrored in the landscape. In this captivating read of short stories with letters to her sister, Knapp shows us how living with loss, abuse, divorce, poverty, and domestic violence can give us life lessons. 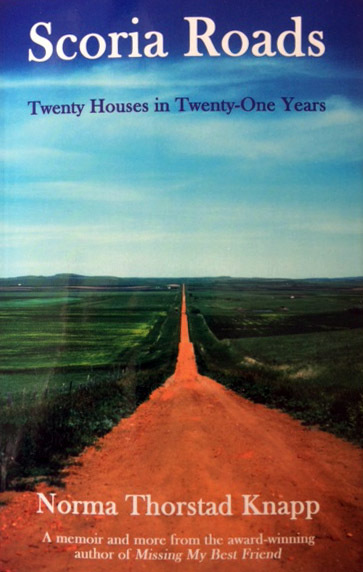 After each letter Knapp writes heart-rending stories about living in twenty different houses in her first twenty-one years. This is a touching meditation on what it means to love, lose, accept, and negotiate fate’s obstacle courses. The memoir is filled with Knapp’s towns and landscapes changed from the sweet safe ’40s and ’50s to a chaotic world today caused by a blistering oil boom. Throughout we learn tidbits on North Dakota’s and our nation’s histories, the Norwegian immigration and their early mores and traditions, and how family can provide a safety net, binding us together. Ultimately, Scoria Roads is a profound affirmation of the importance of hope, love, caring teachers, resiliency, and extended family. 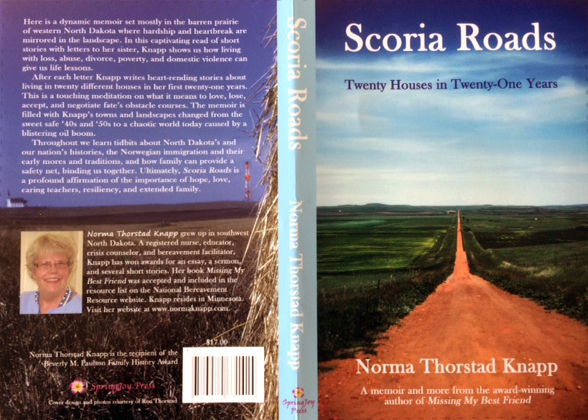 "Scoria Roads" was nominated for a 2016 Minnesota Book Award in the Memoir and Creative Nonfiction category. It did not make the list of finalists but was an honor to be nominated. "Missing My Best Friend" has been accepted into the National Bereavement Resource List on their website. Norma Thorstad Knapp grew up in western North Dakota, Idaho, and Oregon. Her family moved often, giving her a rich foundation for writing. After college, she worked as a registered nurse, educator, crisis counselor, youth specialist, and bereavement facilitator in cities in North Dakota, Texas, and Minnesota. She has published numerous stories, essays and poems; several short stories and a sermon have won awards. Her days are full with reading, writing, traveling, time with grandchildren, creating note cards, and hospice volunteer bereavement work. She has a grown daughter and son and four grandchildren. I have had several short stories, poems, and essays published in various publications - locally, regionally, and nationally. Two of my stories have won awards: 1) the Carol Bly Award in Nonfiction for my story "The Showing" in Dust and Fire, a university literary journal, and 2) a Top Ten Award for my story "The Tipping of the Pontoon" in Minnesota's Lakes Alive magazine. A few years ago, I was awarded an Individual Artist Fellowship by Minnesota's Region Two Arts Council; and about 10 years ago, I was chosen for and attended the Minneapolis' renown Loft Literary Center's Master Writer Program.